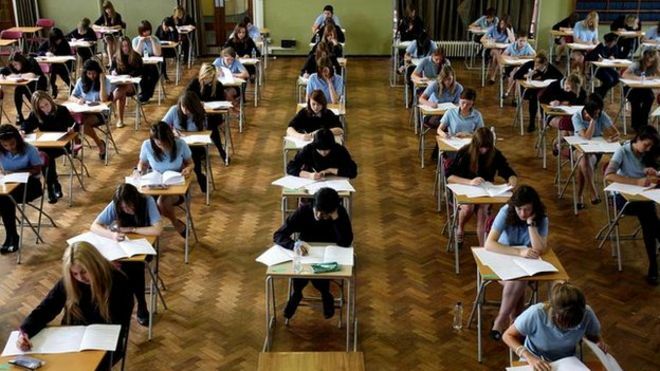 Schools where pupils fail to get good GCSE grades in English and maths should pay a levy to fund pupils who re-take their exams in further education colleges, says a think tank. Policy Exchange has published a report highlighting that FE colleges in England teach a higher proportion of pupils re-sitting exams than schools. But FE colleges face greater pressures on their budgets than schools. Two teaching unions have criticised the levy proposal. Brian Lightman, of the Association of School and College Leaders (ASCL), said the idea of a levy was an "own goal". The report from the right-leaning think tank suggests re-allocating financial support to further education colleges in England which take on pupils who have previously struggled in school. It proposes that secondary schools where pupils have failed to achieve at least C grades in GCSE English and maths should face a financial penalty of about £500 per pupil which would then be used to support students retaking exams in further education colleges. 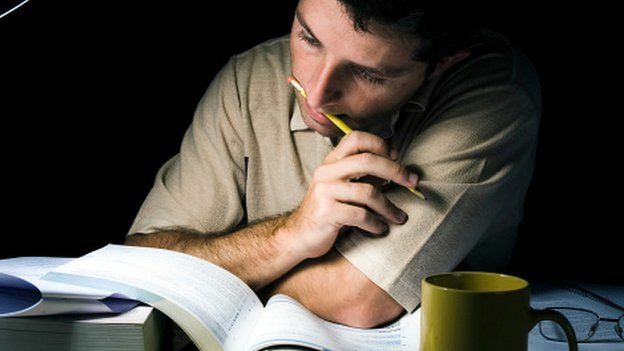 There are five times more students retaking English in FE colleges than in schools, says the report. For maths, almost six times as many retakes are in FE colleges as in schools. Natasha Porter, author of the Policy Exchange report, said: "It is unfair for some schools to pass the buck to FE colleges who are already facing extreme funding pressures to fix a problem they have not caused themselves. "To recognise the additional burden on FE colleges and shoulder more responsibility, schools should cough up and pay a re-sit levy." A Department for Education spokesman defended the existing arrangements. "Post-16 funding is already allocated on a per pupil basis, and we already provide an extra £480 per student, per subject for all those with GCSE English or maths below grade C," he said. In terms of funding, while school budgets have been protected in cash terms for the next five years, further education colleges face growing financial problems. Last month, the National Audit Office (NAO) warned that the further education sector was "experiencing rapidly declining financial health". At the same time, the number of retakes is likely to increase because of a requirement for pupils to retake English and maths if they fail to get at least a C grade. Mr Lightman of the ASC said funding for post-16 education "urgently needs to be addressed", but he argued that taking money from schools would be a step backwards. "Schools are already facing real-terms cuts in their budgets and unprecedented difficulties in recruiting staff, particularly maths teachers," he said, "a re-sit levy would potentially worsen this situation." John Widdowson, president of the Association of Colleges, welcomed the recognition of the funding pressure on his members and said it was "extremely disappointing" that the government had failed to ring-fence spending for colleges in the way it had for schools. But Christine Blower, leader of the National Union of Teachers, said the think tank's proposals would in fact "penalise secondary schools without improving matters substantially for further education colleges". A Department for Education spokesman emphasised the importance of key subjects such as English and maths. "If young people have not mastered them by 16, it is more likely they will be held back for the rest of their life," he said. "That is why we want all young people who do not achieve at least a GCSE C in English or maths to continue studying until they reach that standard." A separate report being published on Tuesday emphasised the achievement gap between rich and poor that had opened by the age of 11. An analysis of primary school test results in England showed that in the most deprived areas, 31% of pupils did not reach the expected levels in English and maths, compared with just 11% in the wealthiest areas. The study of the 2013-14 test results was published by the New Schools Network, which supports the opening of free schools. "This important new research shows the deep inequality that still exists within the state school system," said director Nick Timothy. "We have many excellent schools in England but it cannot be right that children from poor families are three times more likely to be unable to read, write and add up properly than children from wealthy families." A Department for Education spokeswoman said that the pupil premium, worth £2.5bn per year, is supporting disadvantaged children and narrowing the attainment gap. "We are determined to ensure every child regardless of background is given an education that allows them to realise their potential," said the education department's spokeswoman.